(Foxglove Beardtongue (Penstemon digitalis) - 04) This small cluster of foxglove beardtongue was growing up through the blue shale rip-rap along the shore of Sleepy Hollow Lake. 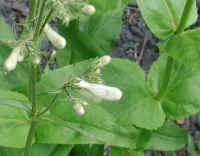 Note that the leaves are lanceolate in shape, grow opposite from one another, and are sessile (have no stems, growing directly from the wild flower stalk). (Foxglove Beardtongue (Penstemon digitalis) - 04a) In this enlarged section of the previous foxglove beardtongue photo, we can see more of the leaf detail described there, including the finely saw-toothed edges. 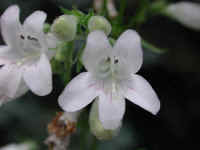 Note the much smaller leaves that grow at the base of the branching flower stalk. This photo also brings out the hairy surface of the stalks, stems and buds. 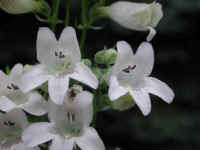 (Foxglove Beardtongue (Penstemon digitalis) - 01) The actual size of the foxglove beardtongue blossom is about one inch long, or about one-half the size of the flowers in this enlarged photo. (Foxglove Beardtongue (Penstemon digitalis) - 01a) In this photo of the foxglove beardtongue we get a closer view of developing buds, mature flowers, and flowers that have faded. 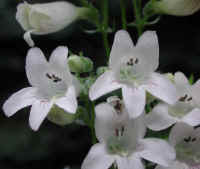 (Foxglove Beardtongue (Penstemon digitalis) - 02) In this photo of the foxglove beardtongue we can see five petals that form the tubular corolla (the petals taken collectively). 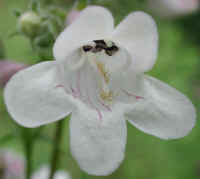 The open end or "mouth" of the flower has a two-lobed upper "lip", and a three-lobed lower "lip". The five stamens can be seen inside the open "mouth" of the flower: four of them above with anthers (dark), and the fifth sterile stamen covered with hairy filament, lying on the bottom, forming the "bearded tongue". 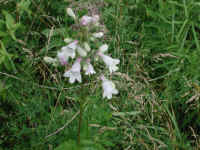 (Foxglove Beardtongue (Penstemon digitalis) - 03) The foxglove beardtongue is a member of the Figwort family (Scrophulariaceae). 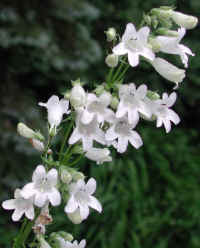 There are also several other species of beardtongue, but this one is the most common. (Foxglove Beardtongue (Penstemon digitalis) - 05) This photo gives us an even closer view of the structure of the foxglove beardtongue. (Foxglove beardtongue (Penstemon digitalis) - 05a) This is a bee's eye view of the anthers on the tip of the stamens near the "roof" of the foxglove beardtongue's "mouth". In this magnified image, the petal cell structure is visible. (Foxglove Beardtongue (Penstemon digitalis) - 05b) This is another magnified picture of the the "bearded tongue" of the foxglove beard tongue. Such detail speaks forth the glory of God, even when spoken in silence. 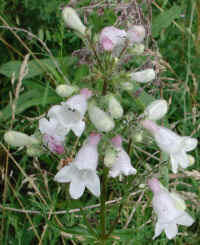 (Foxglove Beardtongue (Penstemon digitalis) - 06) We spotted this foxglove beardtongue growing along the side the side of the road while we were on one of our walks in late June. 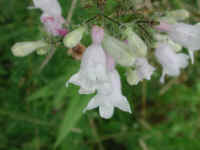 (Foxglove Beardtongue (Penstemon digitalis) - 06a) This is a closer look at the bloom of the foxglove beardtongue. (Foxglove Beardtongue (Penstemon digitalis) - 07) This is another look at some of the foxglove beardtongue buds and flowers. (Foxglove Beardtongue (Penstemon digitalis) - 07a) In this close up look at the foxglove beardtongue, we can see the tiny hairs that cover the outside of the this wildflower's stems, sepals, buds, and flowers. 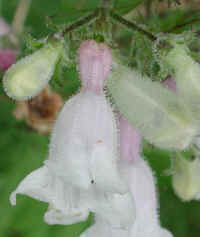 (Foxglove Beardtongue (Penstemon digitalis) - 08) This is another look at a foxglove beardtongue flower. 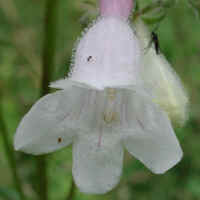 (Foxglove Beardtongue (Penstemon digitalis) - 09) In this photo of the foxglove beardtongue, we have a clear bee's eye view of the inside of the flower. 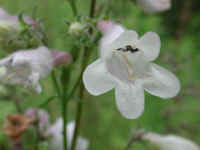 (Foxglove Beardtongue (Penstemon digitalis) - 10) This is another look at a foxglove beardtongue flower with a visitor.